After years of mismanagement, the Tribune Company newspapers -- including the Chicago Tribune and L.A. Times -- are up for sale. Yes, those Koch brothers: the billionaire businessmen who run Koch Industries, a sprawling multinational corporation involved in everything from oil to fertilizer to paper towels to bankrolling right-wing political causes. 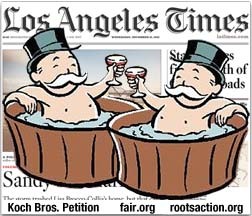 Don't sell out journalism by selling your papers to the Koch brothers. Threats by staff to quit are probably music to their cost-cutting ears. We need you to stand up for journalism by refusing to sell. 68112 Sun Nov 24 08:27:49 EST 2013 Patricia Newman Gibson, LA , US I loved your newspaper in prior years. Your standards dropped in the last 10 years. I stopped your paper and reported my feelings to your office. I hope you do not sell out to anyone. Just report the news More....in an unbiased manner. Then you will sell papers my friend! 68111 Fri Nov 22 19:48:08 EST 2013 Terry Elwell Wenatchee, WA , US RES IPSA LOQUITOR!! !